The Chanson Miracle M.A.X. packs a punch in power and performance. The M.A.X. delivers extreme values with pH = 1.8 on the acid side to pH 12.1 on the alkaline side, and with an ORP ranging from +1200 to -920. Residential and Commercial Ionizer: M.A.X. is excellent for daily production of alkaline drinking water, and powerful enough to sterilize and disinfect at home as well as in commercial settings such as clinics, restaurants, kitchens in the food preparation industry, gymnasiums, spas, and more. Himalayan Rock Salt: The Miracle M.A.X. uses himalayan rock salt to make incredible acidic water that kills viruses, germs, and bacteria on contact in a completely environmental, non-toxic way. The M.A.X kills E-coli and Staph instantly according to testing performed by a third-party certified laboratory. Flow Control Valve: Want it stronger? You’re in charge! The M.A.X. 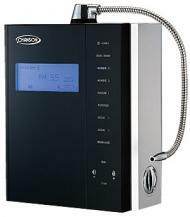 features a control flow control valve to increase or decrease flow rate and strength of the acid or alkaline water. 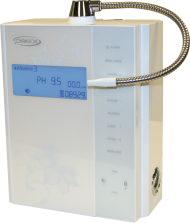 There is nothing more important on a water ionizer than being able to adjust the water flow speed to get the best results. Our side mounted ceramic flow valve is silky smooth and will perform year in and year out. 7 nano-coated, titanium plates make up 364 square inches of ionizing power. The Miracle M.A.X. outperforms other ionizers on the market thanks to its advanced electronic delivery system that allows lower power usage for maximum ionization output. The lower power usage produces less heat inside the ionizer and, as such, contributes to extend the useful life of the unit. 2 colors to choose from: The Miracle M.A.X. comes in choice of black or white to suit your kitchen's decor. pH levels 1.8 to 12.1. Each level is micro-adjustable to every pH level desired. Miracle M.A.X. uses minimal counter space. Hot water sensor and auto alarm. 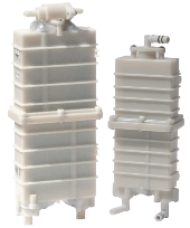 Low and high water flow alarms to let you know where you are not getting maximum ionization. The M.A.X gives audio prompts for all functions and settings with adjustable volume or on/off function. Change filter notification (usually 10 to 12 months). Thoroughly tested and approved by both UL and CE organizations. BPA, Lead, Mercury, Cadmium and Iron free materials ~ ROHS compliant. Ability to do periodic Citric acid cleanings without needing to purchase any special filters or products. Permanent filter cup can be filled with the cleaning solution, and run effectively to clean throughout the machine. Eventually all water ionizers need this cleaning, regardless of how well the auto cleaning cycle works. Integrated wall mount inserts on back of unit. Dimensions: Height 12" x Width 9.75" x Depth 5.5". Effective Flow Rate: 2 - 2.5 liters per minute at 45 PSI water pressure. pH Levels: 1.8 to 12.1. ORP Levels: +1,200 to -920. Number of Plates: 7 at 3.5" x 7.25" (364 square cm total surface area), 99.989% pure titatnium with Chanson exclusive platinum clad nano coating. Filter Life: 9,000 L (approx. : 10 - 12 month of use). Water Pressure: 8 - 70 PSI. Power Consumption: SMPS electronic variable power supply, 50-125 watts. Filter: 5 micron coconut shell carbon block with anti-bacterial silver coating.